DL allergen detection; folded optical devices; skin-like sensor. 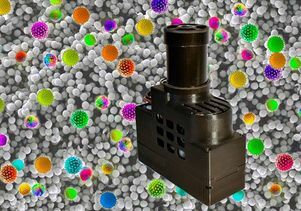 To identify and measure airborne biological particles, or bioaerosols, that originate from living organisms such as plants or fungi, UCLA researchers have invented a portable device that uses holograms and machine learning. The device is trained to recognize five common allergens — pollen from Bermuda grass, oak, ragweed and spores from two types of mold, and has shown an accuracy of 94 percent using deep learning. The device weighs less than 600 grams. The device pulls in air and traps particles on a sticky surface that is lit up by a laser, which generates a hologram. An image sensor chip scans the hologram and sends that data to a remote server, the team explained. There, a type of artificial intelligence powered by a neural network cleans up the image, which is then run through an algorithm that crops it down to the sections that depict the biological particles. A second neural network classifies those particles from among a set of preloaded allergen types. The device can be made from parts costing about $200. It weighs less than 600 grams — approximately the same as three smartphones — and measures about 14 centimeters wide, 17 centimeters long and 6 centimeters thick. The researchers pointed out that because the device is controlled wirelessly, it could potentially be carried by unmanned vehicles such as drones, which would allow scientists to monitor sites that would otherwise be dangerous or difficult for humans to reach. It could also be used in a network of sensors covering a wide area, which would enable scientists to create maps of pollen, spore and microbe density. 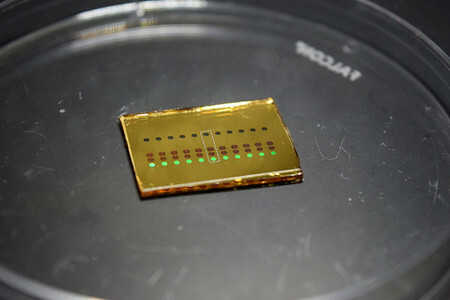 According to Andrei Faraon, professor of applied physics in Caltech‘s Division of Engineering and Applied Science, the next generation of electronic devices, ranging from personal health monitors and augmented reality headsets to sensitive scientific instruments that would only be found in a laboratory, will likely incorporate components that use metasurface optics. He explained that metasurface optics manipulate light similarly to how a lens might—bending, focusing, or reflecting it—but do so in a finely controllable way using carefully designed microscopic structures on an otherwise flat surface, which makes them both compact and finely tunable, attractive qualities for electronic devices. An array of 11 metasurface-based optical spectrometers, pictured here before the final fabrication step. Each spectrometer is composed of three metasurfaces that disperse and focus light with different wavelengths to different points. At the same time, engineers will need to overcome several challenges to make them widespread. The problem is that most optical systems require more than a single metasurface to function properly, Faraon said. In metasurface-based optical systems, most of the total volume inside the device is just free space through which light propagates between different elements. The need for this free space makes the overall device difficult to scale down, while integrating and aligning multiple metasurfaces into a single device can be complicated and expensive. To overcome this, Faraon’s group has introduced a technology called “folded metasurface optics,” which is a way of printing multiple types of metasurfaces onto either side of a substrate, like glass. In this way, the substrate itself becomes the propagation space for the light. As a proof of concept, the team used the technique to build a spectrometer, which is a scientific instrument for splitting light into different colors, or wavelengths, and measuring their corresponding intensities. A compact spectrometer like the one developed by Faraon’s group has a variety of uses, including as a noninvasive blood-glucose measuring system that could be invaluable for diabetes patients. 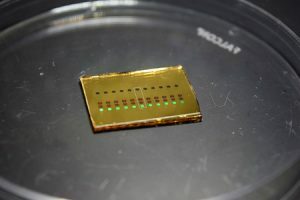 The platform uses multiple metasurface elements that are fabricated in a single step, so, in general, it provides a potential path toward complex but inexpensive optical systems, the team added. Since injuries can’t heal without a constant influx of blood’s key ingredient — oxygen, a new flexible sensor has been developed by UC Berkeley engineers that can map blood-oxygen levels over large areas of skin, tissue and organs, potentially giving doctors a new way to monitor healing wounds in real time. 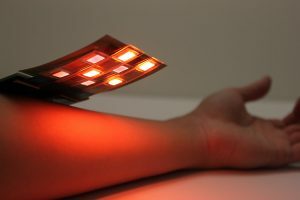 The sensor was made of an alternating array of printed light-emitting diodes and photodetectors that can detect blood-oxygen levels anywhere in the body. The sensor shines red and infrared light into the skin and detects the ratio of light that is reflected back. The sensor is made of organic electronics printed on bendable plastic that molds to the contours of the body. Unlike fingertip oximeters, it can detect blood-oxygen levels at nine points in a grid and can be placed anywhere on the skin. It could potentially be used to map oxygenation of skin grafts, or to look through the skin to monitor oxygen levels in transplanted organs, the researchers said.